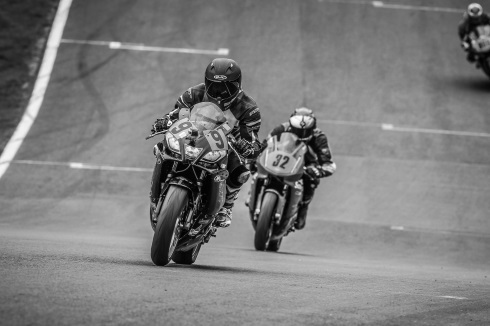 The 16th and 17th June was Round 5 of the BEMSEE 2016 season and it took place at Oulton Park in Cheshire near Little Budworth. The event was held over Friday and Saturday with qualifying on the Friday and races on the Saturday. I had fitted my new fork springs, changed the fork oil and fitted new piston rings and cylinder heads for this round. The bike felt great straightaway the springs made a huge difference and the only issue I had was as I got faster on Friday I started to bottom the forks out. A quick addition of some more fork oil on friday night and this problem was resolved for saturday. The front end of my bike has been completely transformed and by the end of the event I was breaking hard right up to the apex and never once felt like the bike was unhappy with me doing that. MRO Minitwins to start, I qualified in 24th with a laptime of 2:00.984, a new PB after my first ever visit to the track last year and having found confidence on the SV. Race 1 saw 9 riders DNF even though it was dry and bright. I found myself in 14th at the end and scored 2 points, my first in the MRO championship since moving up from the rookies in 2014. My fastest lap of the race was 1:57.822. Race 2 was on Saturday afternoon and again the weather was bright and dry. I started 14th and lost a couple of places finishing in 17th my fastest time was a 1:57.366. In the Thunderbike Sport championship, I qualified in 20th with a time of 1:58.866. In Race 1 I moved up one place and finished in 19th with a time of 1:57.605. In Race 2 I finished in 16th with a time of 1:57.296. TB Race 1. I qualified 20th with a time of 1:58.866 and finished in 19th with a fastest laptime of 1:57.605. MT Race 1. I qualified 24th with a time of 2:00.984 and finished in 14th with a fastest time of 1:57.822. MT Race 2. I started 14th and finished in 17th with a fastest time was 1:57.366.